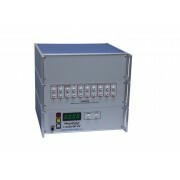 Surge Tester 1.2x50-10P PV, Rated to 10kV, Tester includes CC option with 0 nF tap, No Fast Charge. 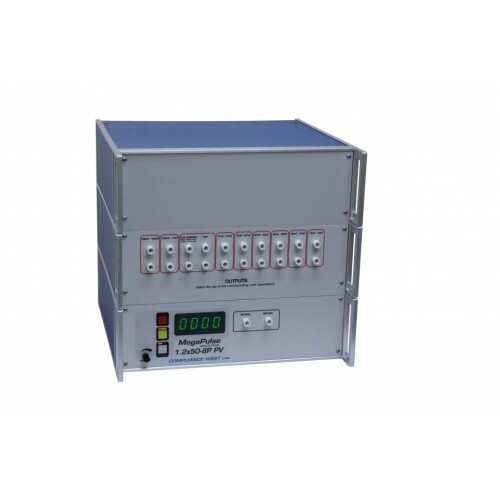 The MegaPulse 1.2x50-10kV PV is specifically designed to perform the Input Test on PV Panels in accordance with IEC 61730-2, Para. 10.5.3. The output is in accordance with the published waveform from 800-10000V peak (open circuit). IEC 61730-2 stipulates that an in-tolerance 1.2x50mSec waveform be delivered to the PV Panel during testing. The MegaPulse 1.2x50-10P PV is provided with output taps corresponding to the capacitance of the PV panel being tested. Complies with IEC 61730-2 Para. 10.5.3 and IEC 1180 tolerances for a 1.2x50 waveform when testing a PV panel with a capacitance range from 10nF - 100nF. Taps from 100nF - 180nF are provided for reference testing only. Taps for 0-10nF, 10-15nF, 15-25nF, 25-40nF, 40-60nF, 60-80nF, 10-100nF, 100-122nF, and 122-180nF are provided. To obtain claimed results, leads must be prepared per the instructions in the Manual. Can be controlled via 32 bit Windows computer with TestMinder option. See Waveforms in Manuals Section, below. Outputs a 1.2x50uSec waveform for testing of Photovoltaic Panels, corrected for panel capacitance. Provides correct waveform for any panel 10 - 100 nF; taps provided for 100-180 nF are for Reference Only. Can be controlled from computer with Option Testminder. Outputs up to 10000V peak. Available TestMinder for computer control of long test sequences. NIST Calibration provided; A2LA Calibration optional. For Specifications, see Datasheet, above.